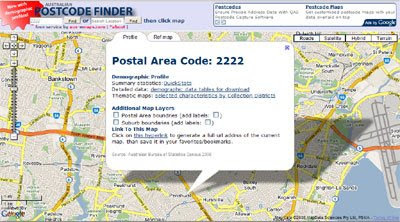 Australia Postcode Finder uses Google geocoding and third party services to show Australian postcode areas. A postcode search can be performed as either a text search or as a geographic query with a simple click on the map. When the user searches the map an information window opens over the location with links to census and demographic information for the area. It is alos possible to show the postcode and suburb boundaries on the map. It is even possible to get the url address for the current view. The Australia Postcode Finder is the latest map from aus-emaps.com, which has itself just undergone a major redesign. The site aims to provide the most comprehensive point of reference and collection of online maps of Australia as well as location specific information. Thank you! I've been looking for something like this for ages.